Click Here to see an active Google map of my route. Hey everyone! I went for a ride up north to Clear Lake today and unlike last weekends ride this one was about perfect. You may notice that the route I wrote up on paper the night before the ride varies from the link I shared at the top of the post. We'll get to that in a bit. I woke up at 0615 threw some coffee on, did the normal morning routine stuff and made some breakfast. I wanted to be on the road by 0700. I'm not sure if I had mentioned this before but wearing the textile pants without a pair of jeans underneath did not go so well on my first ride. The inside material gets clingy if you start to sweat and it's just not comfortable; so this time around I decided that I was going to wear jeans underneath and should I get too hot I would take the textile riding pants off and just wear the jeans. It turns out that I made the right decision, while I was anticipating a hot day it actually stayed cool and I was able to ride with the textile jacked (sans liner) and the textile pants (with the jeans underneath) all day long with no issue. Actually, there were points on the ride where I had wished that I had the jacket liner! 36.2 miles in on Berryessa Knoxville Rd after turning off of CA 128: I had pulled off the to take a picture and as soon as the tires hit the gravel I remembered that I most likely got the flat from a well placed rock. I made sure from then on only to pull over where there was a paved shoulder. I also made sure that I kept an eye out for rocks in the road as well and had a handful of times where I had to adjust my line mid-turn to avoid some rocks. Though if I was still riding in Wisconsin I'd be dealing with loose gravel in almost every turn at this time of the year so no complaints. 39.3 miles in on Berryessa Knoxville Rd at a turnout, The giants bird's nest on the capacitor bank caught my attention. It turns out that it's actually set up with a pedestal for a birds nest to be built there. The view the other way was spectacular! 50.0 miles in on Berryessa Knoxville Rd. Access denied... The road was blocked off for the Napa Valley Triathlon They weren't going to let anyone go through until all the bikers (who were just starting to come out of the water) cleared the 7 mile stretch of road that shared my route. They said that the wait would be an hour and a half. Luckily I had cell reception and was able to use my iPhone to plot another route which is the one you see at the link at the top of the post. They had "special event ahead" signs posted and I have run into cycling events on Sundays past in Wisconsin and had to adjust my route accordingly so no big deal. The park ranger and the policemen were accommodating so nothing to do but find another way. I do need to invest in a good paper map that has all the smaller roads on it though. This making a list of turns and hoping that everything goes to plan is going to bite me one of these times. 72.8 miles in on Pope Valley Rd I just though the clouds over the mountains in the distance looked cool. Snapped a self-pic while I was at it. 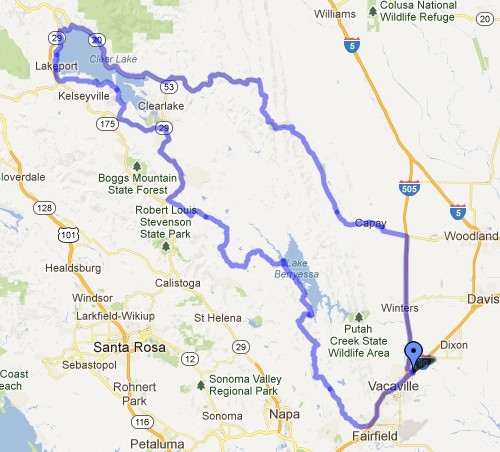 123.1 miles in at Library Park in Lakeport, CA off of CA 29. A shot of the FZ, a couple of the lake and one of me with pretzels in my mouth. At this point of the ride I was feeling pretty chilly; that's what 9 days in the 90's will do to you. High 60s feel cold already. ...This guy parked like a moron... That is all. Hope you enjoyed the write-up should anything come up throughout the week I will make sure and share it here. Thanks for reading!